The Conquistadors took it. The Spanish Jesuits hid it. The Spanish Franciscans found it. Gold dripped from the mountains. The famous legends of the Santa Catalina mountains claims that the Spaniards forced the natives to work gold mines in the mountains. The location of the mines was lost in time, but some parts of the legend gives additional clues. That is what spawned the Lost Escalante mine and Iron Door Mine legends that brought prospectors to Arizona's Santa Catalina mountains. There, they discovered gold. Lots of gold. Some of it may still remain. While silver and copper mining was conducted by the newly settled Spaniards throughout Pimeria Alta in the late 1600s, gold was also a sought after commodity. Pimeria Alta is the name given to the land which eventually became Arizona. Several accounts mention that the Spanish Jesuits operated the mines- which would place it in the early 1700's when Father Eusubio Kino established the first Spanish settlements from central Mexico north to the Tucson valley. Kino help build the San Xavier del Bac mission southeast of present-day Tucson. At the time, only rancherias dotted the valley. The natives outnumbered Spanish settlers, clergy and military. But, no records are available of the gold or other minerals extracted from the mountains. Although one of the reasons Kino came to New Spain was to enforce an edict from the King of Spain that forbid enslaving natives to work in the mines. "Gold placering in Canada del Oro ("gold gulch") was undertaken in the northern Santa Catalina Mountains by Spaniards as early as the mid-1700's. The canada drainage flows northward from its headwaters in the central Santa Catalina Mountains through about 9 mi of the Forest Unit, then crosses the Unit boundary and turns south, flowing parallel to and mostly outside of the Forest Unit." (1, p. 24). Read more about The Lost Mine and the Lost Escalante Mine. While the Spanish Jesuits, settlers or military may have mined the Catalinas for gold, they didn't leave any records. Over the last century several reports of Spanish objects found in the Catalinas are the only evidence. Reports of finding gold in the Old Hat and Campo Bonito mining districts spurred the Arizona Gold Rush of the 1880s. Thousands of ouncess of gold had been taken from the mines, according to newspaper accounts and mining reports. "Rich gold strikes are becoming frequent In Arizona They are so numerous and so rich that some hesitancy is made in recording them for the public lost it might be thought they were overdrawn But if there are those who entertain doubts all that is necessary to dispel a dlsbellef is to examine the specimens referred to, or better still, visit the mines themselves. Pinal County, where the Santa Catalina mountains, was a major gold producing area. At the time, gold was valued at only $20.67 per ounce. 1. "Mineral Appraisal of Coronado National Forest, Part 5." U Reprinted 1983..S. Department of the Interior, Bureau of Mines, MLA 25-94, 1994. Funded by a program between U.S. Bureau of Mines, U.S. Geological Survey, and the U.S. Forest Service to assist the Forest Service in incorporating mineral resource data in forest plans as specified by the National Forest Management Act (1976). USBM_MIA_025-094. 177 pages. 2. Heylmun, E. B., 1989, Santa Catalina Mountains, Arizona: California Mining Journal, vol. 69, No. 1, p. 11-15. © 2012 AZentertain.com. All rights reserved. Entertainment Magazine network. BZB Publishing, Inc.
"Treasures of the Santa Catalinas" is NOW Available on Amazon.com. Read sample chapters from the new book "Treasures of the Santa Catalina Mountains" with over 600 pages and more than 1,200 footnotes to the source material. 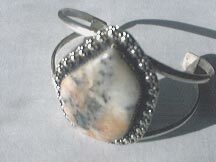 Cody Stone is mined and designed as jewelry grade gold and silver in quartz from the mountains of the Santa Catalinas. Cody stone specimens and hand made items are on display at the Oracle Inn Steakhouse & Saloon in Oracle, Arizona. Get a tour of the area, see artifacts of the Iron Door Mine and Southwest, and mine for gold with Flint Carter. The only source for Cody Stone. Call Flint at 520-289-4566. Locate Camp Bonito with your Garmin GPS. Garmin International is the global leader in satellite navigation. Since 1989, Garmin has designed, manufactured, marketed and sold navigation, communication and information devices and applications  most of which are enabled by GPS technology. Outdoor enthusiasts: Garmin has mapped every hill and valley for your next great adventure. See what's new at the Garmin web site. The popular discount coupon site Groupon has come to Phoenix. Find Today's Daily Deal on the Best in Phoenix! The best online source for camping and RV needs is Camping World. Find web deals on grills, outdoor patio furnishings and more to make outdoor living perfect. Camping Gear, Camping Supplies, Tailgating Supplies at Camping World.